Author(s): Qiong Wu, Cognitive Neuroscience Laboratory, Graduate School of Natural Science and Technology, Okayama University, Japan. Jiajia Yang, Chunlin Li, Yujie Li, Zhihan Xu, Yoshimichi Ejima, Yasuyuki Ohta, Koji Abe, Jinglong Wu. Background: Our brain can collaborate useful information from different sensory stimuli automatically through multisensory integration. However, we cannot understand visual and auditory information clearly from the TV when the sound and graphics are out of synchronization. This is because our brain is not being able to integrate the visual and auditory information automatically. Objective and Method: To determine whether patients with Parkinson’s disease (PD) have the same audiovisual integration as individuals without PD, we designed an experiment using three groups of subjects: 17 normal younger individuals (the NY group), 21 normal aged control individuals (the NC group) and 16 individuals with Parkinson’s disease (the PD group). All subjects were required to press the response key when the auditory, visual or audiovisual stimuli were presented. Results and Conclusion: We recorded the accuracy (AC) and reaction time (RT) for each task. The results suggest that the mean RT of the PD group was significantly longer than that of the NY and NC groups. 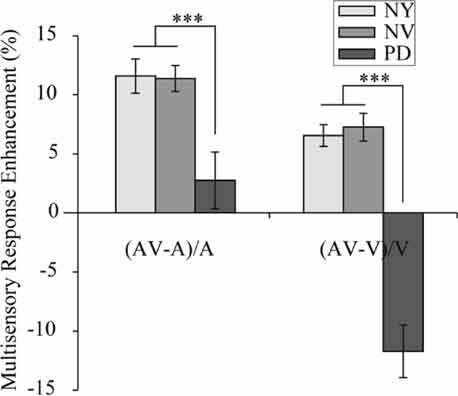 Interestingly, we found that patients with PD exhibited inadequate audiovisual integration and significantly lower enhancement than the NY and NC groups, which suggests the presence of basic cognition errors in PD patients. Keywords: Parkinson’s disease, audiovisual integration, cognitive functional deficits, performance enhancement. Affiliation:Cognitive Neuroscience Laboratory, Graduate School of Natural Science and Technology, Okayama University, Japan. Keywords:Parkinson’s disease, audiovisual integration, cognitive functional deficits, performance enhancement. Abstract:Background: Our brain can collaborate useful information from different sensory stimuli automatically through multisensory integration. However, we cannot understand visual and auditory information clearly from the TV when the sound and graphics are out of synchronization. This is because our brain is not being able to integrate the visual and auditory information automatically.